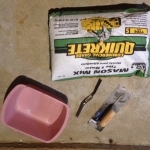 Given that it’s -4F outside right now, it seemed like a post about the heating system we use in the house – and some repairs I had to do to it – was appropriate. 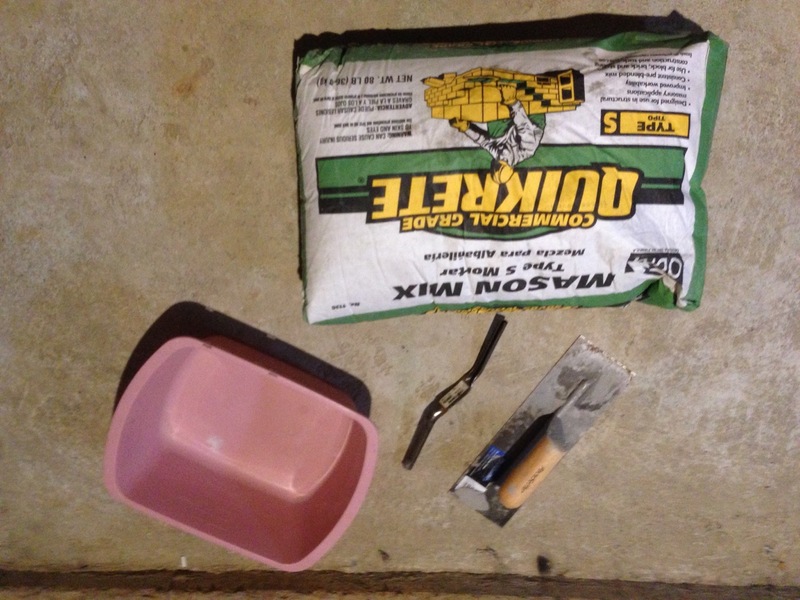 This is the (somewhat long) story of repairing one of the signature features in our house: the in-floor radiant heat on the lower level. As a split-level house, we have one floor (family room level) that is concrete slab-on-grade. 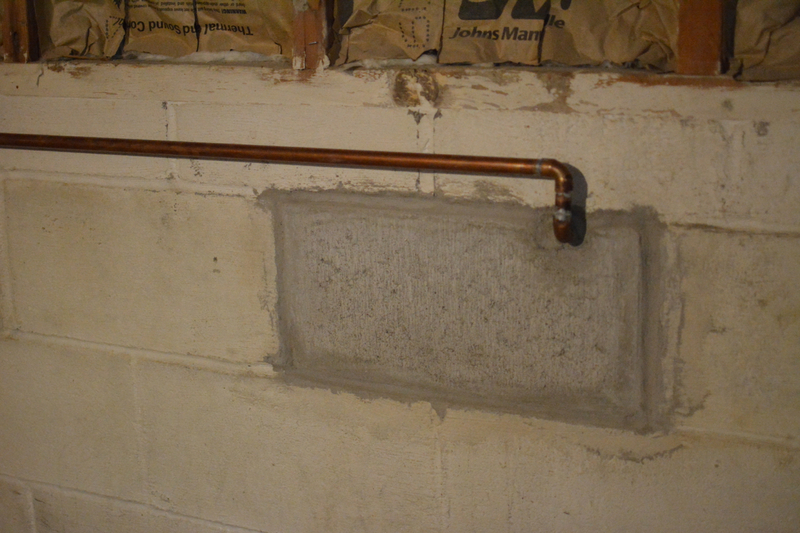 There is one problem with slab-on-grade construction in the Northeast: the concrete gets painfully cold in the winter. When designing the house, my grandfather was aware of this fact and had installed – in 1959 – radiant heat tubing embedded in the concrete. 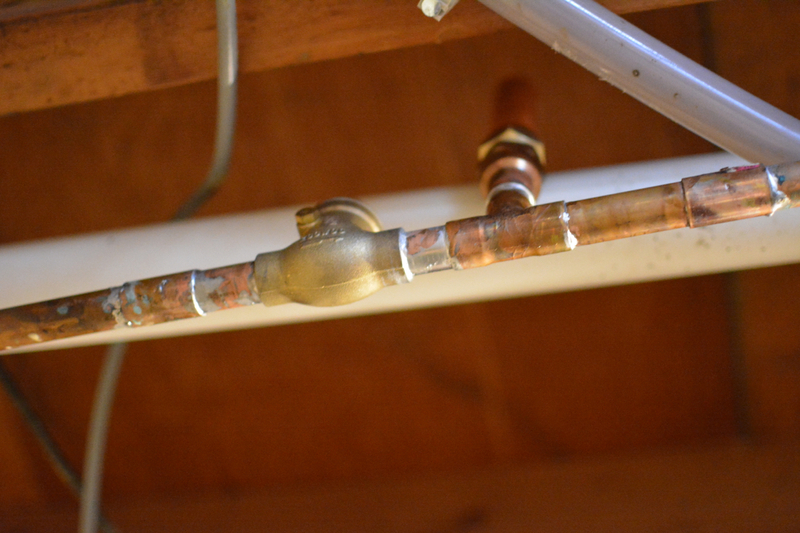 With the radiant heat, warm water is pumped through the piping and keeps the floor (and the room) warm. There was, however, a problem with the radiant heat in winter 2009. 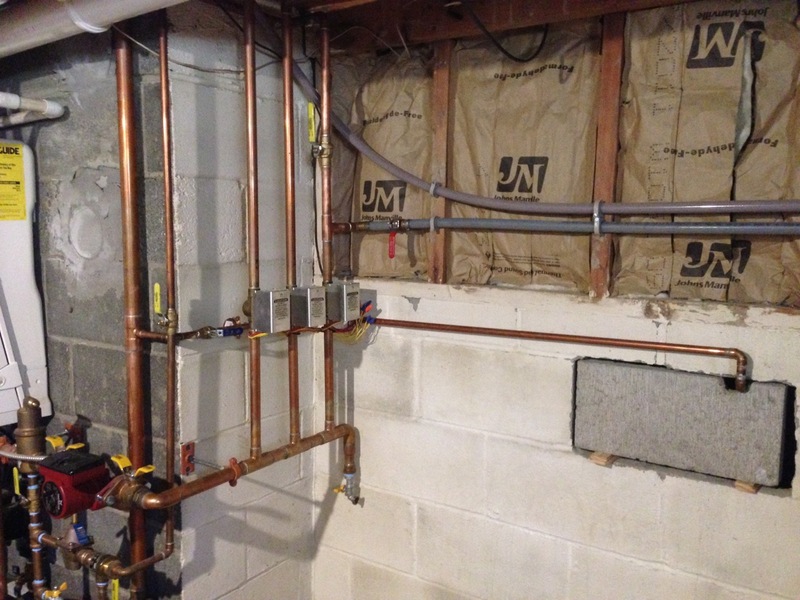 My grandmother had called and indicated that the family room with the radiant heat was very cold and that she had called a local plumber to take a look. This plumbing outfit took a look at the radiant configuration – copper tubing embedded in concrete dating to 1959 – and told her that it was broken beyond repair. They really didn’t do any testing or anything, they just assumed it was bad and told her the best option was to install some (very ugly) hot water baseboard radiators in that level of the house. This new baseboard had several issues: first, it was not really sized correctly to the room, so it would struggle to keep up. And the floor was exceptionally cold. At the time my grandmother had berber carpet in the family so you didn’t notice how cold the floor was – but if you walked into the bathroom or laundry room, your feet hurt the floor was so cold. 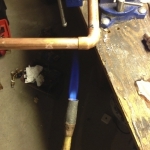 After Mary and I moved in in 2012, I began to look more closely at the then-disconnected radiant heat tubing and eventually decided I would test it and see if I could tell what, if anything, was wrong with it. 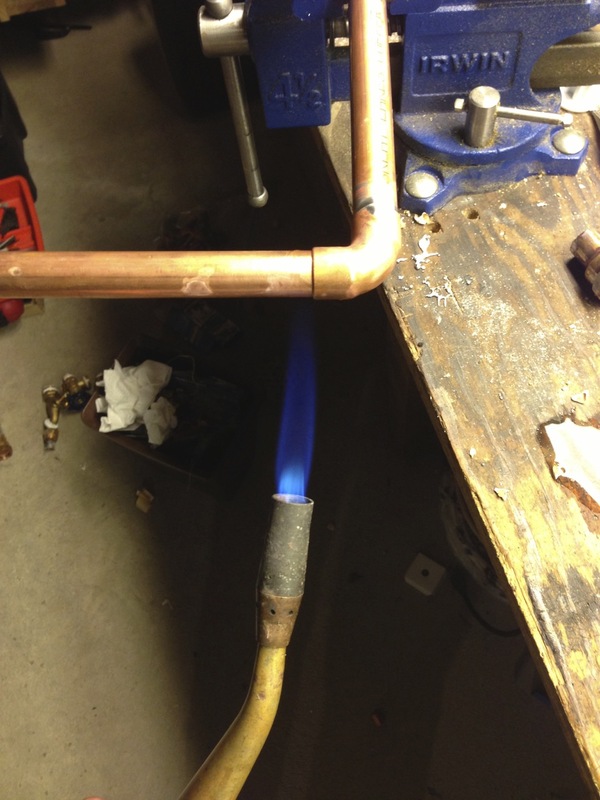 With the help of a friend (the late Matthew Porcari, a high school classmate who was a mason), I gained access to the leads of tubing coming out of the floor and went to work: The first thing I did was attach threaded ends to the pipes and build a small test assembly. 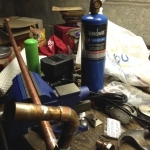 On one end (there are three), I capped it to ensure it was sealed, on the second end I placed a pressure gauge, and on the last lead I rigged a connector to mate with a garden hose and linked it straight to the house water piping. My plan? 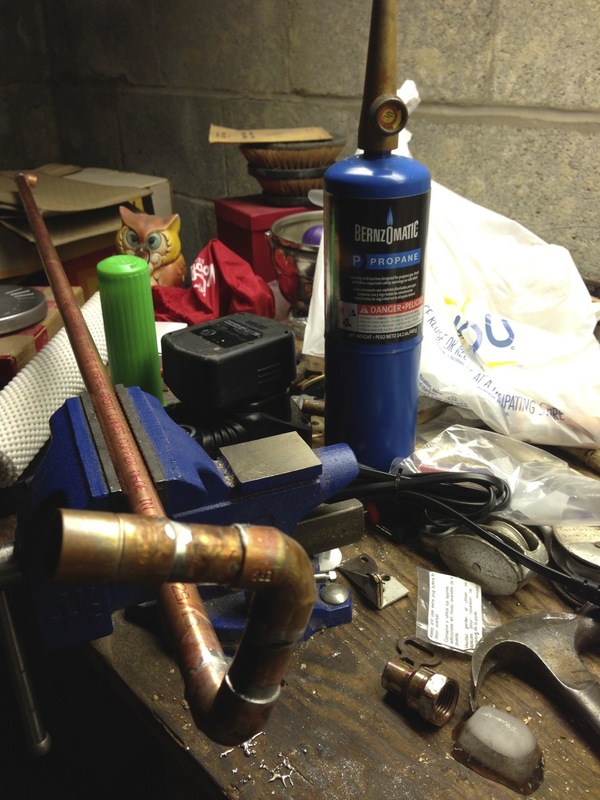 Flush and pressurize the tubing and let it sit for a few days to see if it lost any pressure. 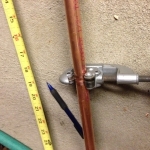 If it holds pressure, I know there is no problem with the piping. The verdict? Success! 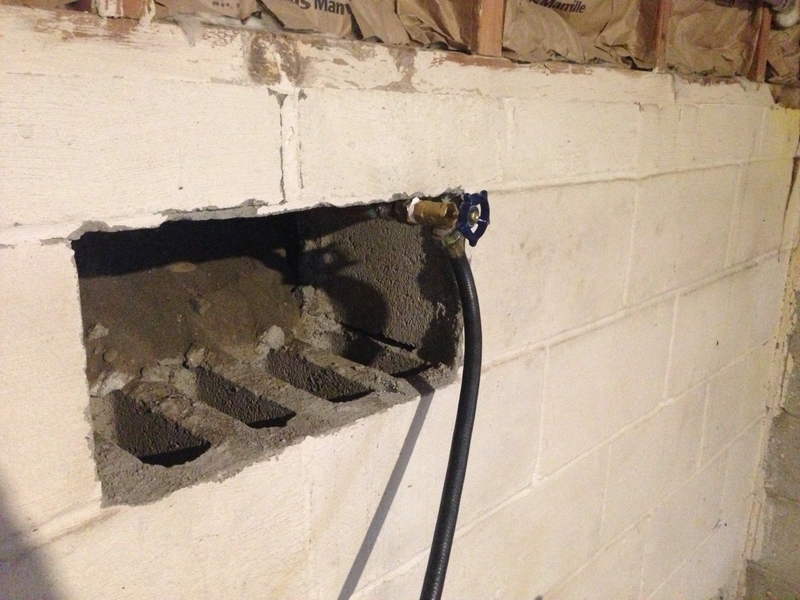 The piping held water, pressurized to about 30psi. So I knew two things: 1. I have good radiant piping and; 2. I’m not calling that plumber to do work here ever. So here’s where things get a little interesting. 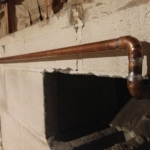 I want to get the radiant heat hooked up, so I asked my regular plumbing and heating outfit – Arctic Bear Plumbing, Heating and Air – about the process of hooking this piping back in. After discussing with them, it was decided that the best approach would be to give it more time. Because I’m slightly impatient (and want my floors warm…by this time I getting ready to replace the berber carpet with much thinner glue-down carpet), I devised a way to hook the radiant into the existing system on a temporary basis. How might you ask? 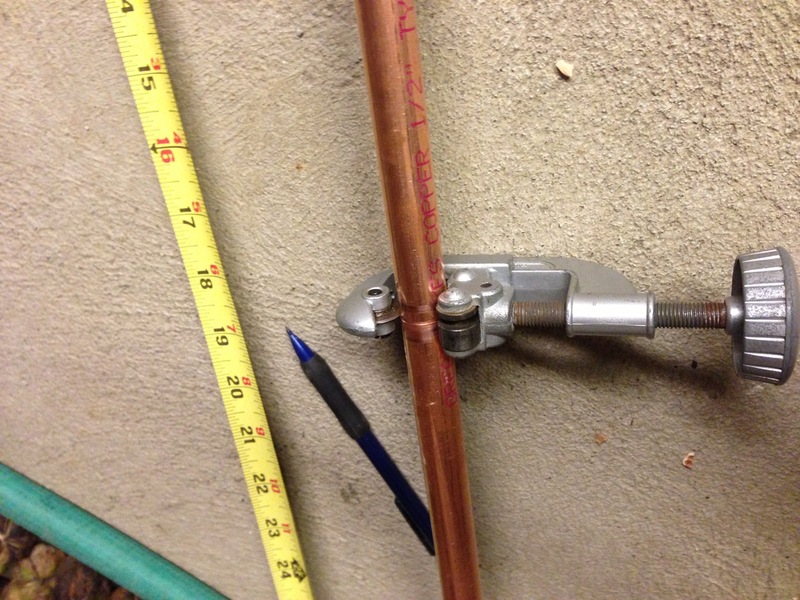 Easy – garden hoses! That’s right. 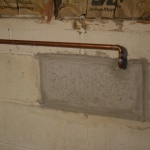 I put appropriate ends on where needed and snaked several garden hoses across the basement to bridge the gaps in piping. This turned out to work great, so we let it run for the rest of the winter until Spring 2013. In late summer 2013, I had our heating guy from Arctic Bear come over to finish the job right and hook back up the appropriate radiant heat. 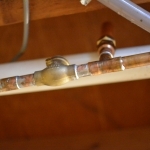 In preparation for his arrival, I prepared by building the appropriate pipe connections that were previously cut out when the radiant was disconnected in 2009. Once our heating guy arrived, he cut in the last components and hooked everything up, then refilled the system with fresh water and got it all back up and running again. But of course, the story doesn’t quite end there. As it turns out, a few months later once the winter of 2013-14 was in full swing, I discovered a “design flaw” with the piping. At first I thought it was a design flaw on my part, but after analyzing it further and making an adjustment that I thought might fix it, I am convinced that it is a design flaw that existed from the time the system was installed. 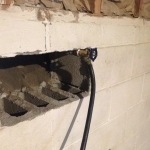 In short, a siphon was created that was periodically “backfeeding” a part of the radiant floor heat, resulting in extra heat even when the zone for the family room was off. This happened because the heat for the lower level enters the floor in the middle, and then splits into two separate (smaller) tubes going to each end of the room, and those smaller tubes exist at each end back into the basement where they join the main return line. This makes the heat more evenly distributed (instead of starting at one end (hot) and moving to the other (cool.) The catch is that on one side of the house, the return pipe is roughly a two feet higher than it is on the other side of the house. 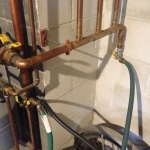 When the zone for the family room is turned off, but another zone (on a higher level of the house) is turned on, a slow but steady siphon effect takes place, pulling hot water back down. I noticed it because the laundry room floor was warm when it shouldn’t be. It took me a few minutes to figure out why. After analyzing what was happening, I decided that this problem had a relatively simple solution: add a swing check valve. 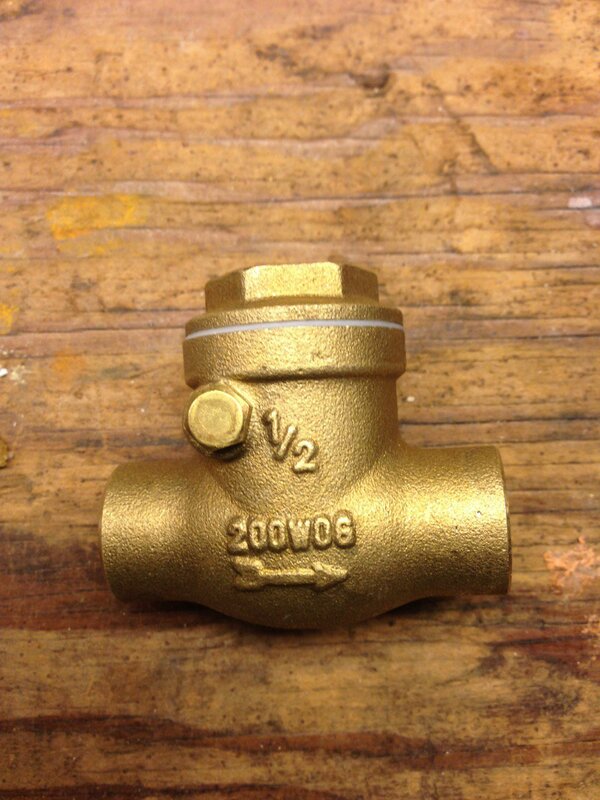 (that is, a valve that only lets water flow in one direction.) 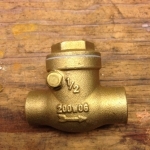 So I went to the hardware story and got a simple check valve, drained the heating system and installed the check valve. Success! No more siphon effect. But then one day a few weeks later I was sitting downstairs, quietly reading and….BANG! 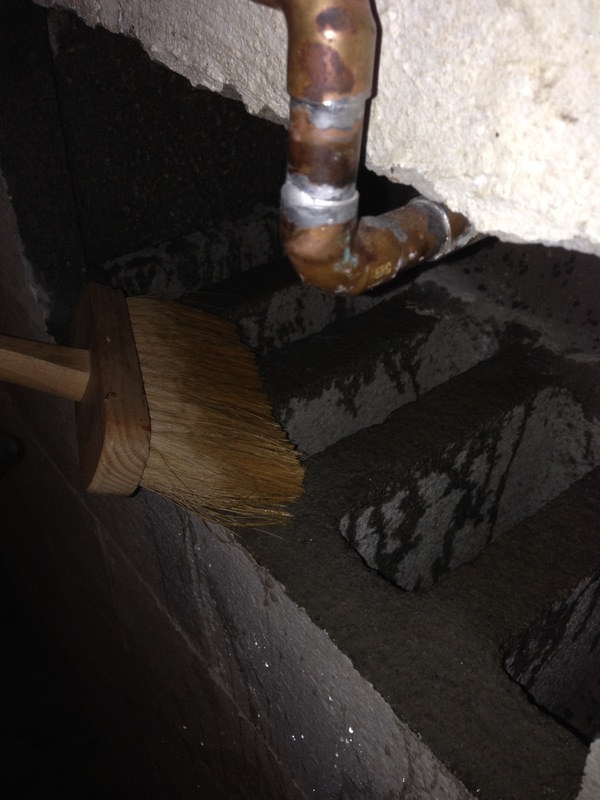 It turns out that adding the check valve introduced a new problem: water hammer. 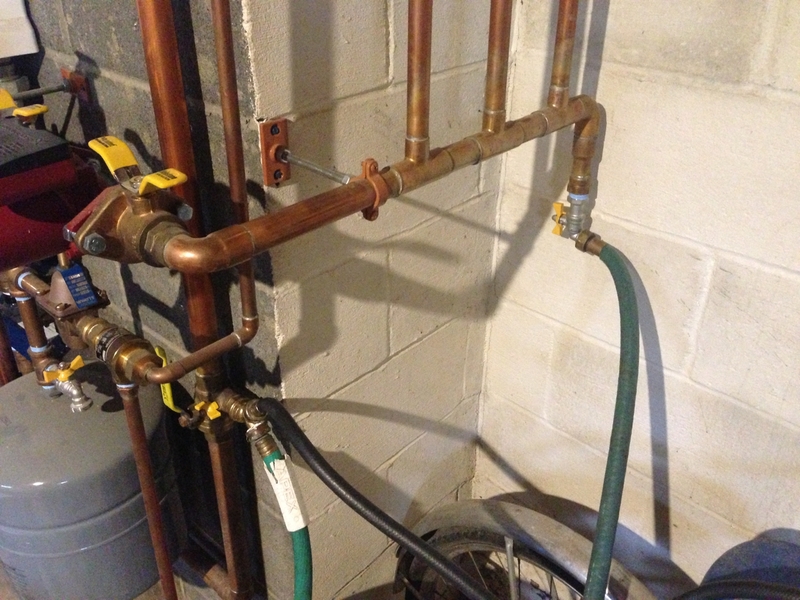 Water hammer is basically “banging pipes.” It happens when water is flowing through a pipe and it is suddenly turned off. The water suddenly stops, but it has inertia that has to dissipate, and it does so by reversing course and flowing quickly back and forth (hence the banging.) 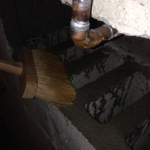 So, to fix this, I ended up also installing a “water hammer arrestor” – basically a cylinder with a sealed air chamber that acts as a shock absorber for the waves of motion. Installing this cut the banging to a relatively low level (but has not eliminated all of it), so I am satisfied for now. 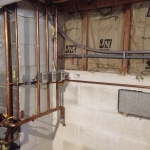 This entry was posted in house history, interior and tagged copper radiant heat, radiant heat, radiant heat repair on February 28, 2015 by Douglas Camin. You rock Doug…awesome investigative skills! Thanks Greg! Excited to see all the new exciting things with the Modbox for you! Great story! You are in great company with homeowners of Wright designed in floor heating systems. 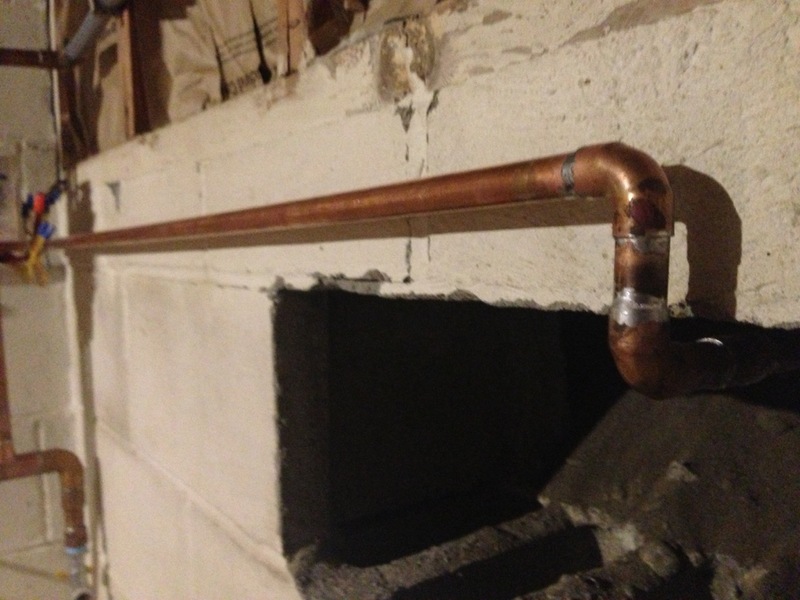 Glad the copper piping has held up. Perhaps a larger arrestor might work? or two? Think they are used on washers too. John – It’s possible a second arrestor may solve it. I’m a little leery of pulling it apart again just on hunches because it’s a fairly large task – have to drain the whole system, cut and sweat the pipes back together, fill everything, check for leaks and then bleed all the air out again (assuming no leaks requiring me to drain it again and fix them.) I think if I do anything else to stop it I’m going to call in my heating folks and let them evaluate it for me. Going to think about it and see!